The 16th annual Governor’s Advanced Manufacturing and High Technology Summit kicked off on Friday with one hitch – there was no attendance by the governor, a first in the event’s history. Standing in for Gov. Chris Sununu, who was unable to make the summit due to weather-related traffic, Business and Economic Affairs Commissioner Taylor Caswell opened the summit at the Grappone Conference Center in Concord by showcasing how manufacturing is expanding as part of the state’s economic engine. Over the past year, manufacturers, including BAE Systems, LSNE Contract Manufacturing in Bedford and Littleton-based Rotobec, have spent $250 million worth of capital investment in New Hampshire. said Caswell. 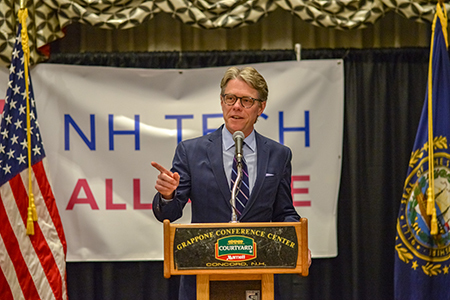 And executives from as far as Silicon Valley are aware of New Hampshire’s educated workforce in the high-tech and manufacturing industries, said Caswell. But New Hampshire’s economic vision can only be accomplished through a holistic approach, said Caswell. “We’ve been spending a lot of time building these collaborations, building these partnerships, talking about this triangle where you have the employer community, you have the state policy makers and you have the academic institutions working functionally together to build a system that inherently has its own substantial differentiators from other states,” he said. He pointed to the Council of Partner Agencies, which brings quasi-governmental agencies, including the Community Development Finance Authority (where Caswell was previously the director), the NH Housing Finance Authority and other groups to discuss a common economic development strategy. Another example is the collaboration to build on the Division of Travel and Tourism Development’s marketing campaign to attract more workers to New Hampshire via choosenh.com. “We have the pieces that we need,” said Caswell. One of the key partners is the University of New Hampshire, which works to match employers with future workers as well as utilize university instruments and advance technology through seed funded projects. According to Jones, 56 percent of UNH graduates stay in New Hampshire and over 50 percent of non-New Hampshire students also stay and work in the state. “This is a win-win. If we can find ways for UNH to partner more with industry, we have ways to make companies more successful,” he said. With the John Olson Advanced Manufacturing Center up and running in Durham, companies have access to customized CNC machining and robotics, and will soon have access to a nano 3-D printer that can print materials down to a nano micro scale as well as a Micro-CT Scanner. Some of the equipment is being purchased through a $20 million, five-year grant from the National Science Foundation that was awarded to UNH and Dartmouth College to assist the Advanced Regenerative Manufacturing Institute in Manchester, called the BioMade project. 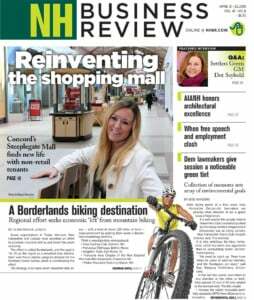 In one-on-one interviews with NH Business Review, every manufacturer spoken to voiced employment challenges as a continuing concern. “It’s nice we have a low unemployment rate, but the unemployment rate in New Hampshire is 2.6, and I would argue maybe even lower in manufacturing. We’re having a hard time finding good, qualified folks – that, combined with the fact a lot of our skilled folks are in their 60s,” said Rob Bujeaud, vice president of engineering at Turbocam in Barrington. The company has developed a “fairly robust” training program with a teacher employed to teach shop math, blueprint reading and geometric tolerancing. But Bujeaud said the company still experienced high turnover for lower-level jobs, as workers felt more enabled by the market to check out salary and benefits at a nearby employer, sometimes only to return back to Turbocam. More New Hampshire companies are employing collaborative robots, or cobots, which work in collaboration with workers. “Hiring employees – that’s the big challenge,” agreed Mike Mastergeorge, vice president of Brazeonics in Hampton, who is looking to incorporate collaborative robots, or cobots, to help augment less desirable operations. A cobot from Boston-based Universal Robots was on display for interested manufacturers. Manchester Community College was able to use a Perkins grant to purchase a cobot for students to work with. In New Hampshire, there are approximately 90 Universal Robots in use, said Steve Jackson, senior automation engineer at Axis New England in North Hampton, who works as a consultant for manufacturers. Jackson said small to large manufacturers have adopted the robots as a helping hand to taking over repetitive tasks. “Just think about space. Space in New Hampshire is very expensive, so now instead of putting a robot in a cage, you can put a robot next to somebody and they can be basically co-working in the same workspace, so you’re doubling what you have in your available space,” said Larochelle, who pointed out that employers will also be hiring students who are familiar working with them.